Samuel Bellamy born February 23rd, 1689 and died on April 27th, 1717; known as Black Sam, Bellamy was an English-born pirate of the early 18th century that operated in the New World. While his days as a pirate lasted barely more than one year, he and his crew captured more than 50 ships before his untimely death at the age of 28. His nickname Black Sam was given by the Cape Cod folks because he didn’t like wearing the fashionable powdered wig and instead tied his long black hair with a band of cloth. Contrary to the pirate community, Bellamy was known to be a merciful and generous pirate – gentlemanly in his ruthless trade. This reputation gained him a second nickname as Prince of Pirates and his crew called themselves Robin Hood’s Men. Youngest of six children born to Stephen and Elizabeth Bellamy on Devonshire, England in 1689; [I] his mother died giving birth to Samuel, buried on February 23rd, 1689, Samuel was baptized on March 18th of 1689. In his youth he learned the sailor trade and traveled to Cape Cod, in his teens and fell in love with Maria Hallett who lived at Eastham, Harbor, Massachusetts. Samuel was not in favor of Samuel marrying their daughter with a poor sailor, although it is said they liked him. So he decided to make his fortune salvaging treasure off the coast of Florida with the help of a friend, Palgrave Williams, a wealthy goldsmith. Before he left, Maria gave him a silver teapot to make tea on his journeys, which he vowed to return with it and enough money to marry. In 1715, accompanied by his friend and financier Palgrave Williams procured a ship for the purpose of salvaging, but their venture didn’t succeed. Bellamy started looting camps of the salvage divers with pirate Henry Jennings. In 1716 Bellamy joined Benjamin Hornigold who was captain of the Mary Anne whose first mate was Edward Blackbeard Teach. Hornigold was merciful to his prisoners and would plunder ships of all flags except English, but the crew was against the policy. Around June of 1716 Sam Bellamy was elected captain of the Mary Anne and Captain Hornigold was deposed. Hornigold had five ships in his fleet, Edward Teach became captain of the Mary Anne, Hornigold in a sloop and crew that stayed with him sailed off. By vote, Samuel Bellamy took command of one of the five ships, the Sultana, and in one year was a successful pirate. Although his ship was fast and maneuverable, in February of 1717, he heard of an English slave ship through the network of pirates and sailors and followed the slave ship, Whydah packed with goods, silver and gold after selling its cargo of slaves in America. After a three day chase, Sam Bellamy captured the ship after the captain and its crew surrendered. Liking the Whydah for its speed and armament, he took over the ship and transferred his cargo and men from the Sultana to the Whydah and allowed its crew to sail away in the Sultana. After such a big prize and the hold filled with bags and chests of booty, including 20,000 pounds sterling from slave trading, the Prince of Pirates decided it was time to sail to Cape Cod and back to his love to make her his wife. On April 26th, nearing Cape Cod, a terrible storm beset the Whydah starting with a thick fog followed by a torrent of rain and gale-force winds. Palgrave William’s ship lost sight of the Whydah and by morning Bellamy’s ship was found floating upon the surface overturned among wreckage and being broken up in the surf. The ship may have survived if it was able to stay away from the breakers and the rocks. Out of a crew of 148, fifty of them freed slaves, only two survived; Captain Bellamy presumed to have been crushed by the heavy cargo when it overturned and drowned. One surviving crew member was hanged as a pirate, and the other, Thomas Davis, a Welsh carpenter, who convinced the authorities that he had been forced to be the ship’s carpenter, swearing that he never took part in any piracy action. He had been a carpenter aboard the St. Michael which Black Sam and his crew captured. It was said that Captain Bellamy promised to set Davis free once another carpenter was found. The hanged pirate was the pilot of the Whydah, John Julian, a half-blood Mosquito Indian from Central America. Some accounts state that Julian was jailed in Boston and not indicted for piracy. Instead, he was sold into slavery, reportedly bought by John Quincy, whose grandson, President John Quincy Adams, became an abolitionist. After being sold to someone else, he tried to escape several times. The last time he escaped he killed a bounty hunter trying to catch him. He was tried and executed for murder in 1733. Richard Noland, quartermaster, Irish from Dublin. He sailed with Benjamin Hornigold and later joined Samuel Bellamy. 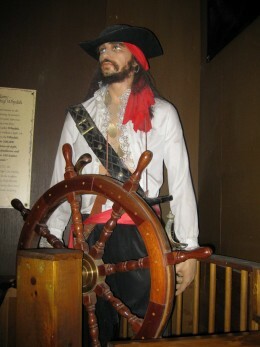 He retired from piracy in 1718. An important and trusted man, he looked after the loot and ensured that all pirates got their fair share. He also inspected weapons, dealt punishment for minor infractions, assigned work details, and managed provisions. His ability of verbal blarney, he could handle a rowdy crew. He was also smart because when he received a pardon and retired from piracy, he didn’t squander his ill-begotten gains and established himself as a respectable citizen. He even served as a character witness at trials of other pirates. Hendrick Quintor served in the Bellamy pirate fleet, born in Amsterdam in 1692; he was African-Dutch and son of a sailor. Working on a Spanish vessel in the Caribbean, Quintor was captured by Hornigold’s pirates and was instrumental in helping Bellamy get support as the new captain. Not aboard the Whydah when she sank in 1717, he was captured the same year and found guilty of piracy in October of 1717. He died at the end of a rope. Joseph Rivers – His career spanned twenty years, a rarity since most pirates died young, if they weren’t smart enough to retire. He joined Bellamy in 1715 aboard the Whydah and died when it sank. Palgrave Williams – Historians wonder why a 39-year-old wealthy man would leave his wife and kids try his hand at salvaging with Samuel Bellamy and later join him to become a pirate. Williams was an American born in Rhode Island. He served as Bellamy’s quartermaster and later a captain of a sloop in the fleet. In the spring of 1717, Williams stopped at Block Island, Rhode Island to visit his mother and sisters, which allowed him because he escaped the storm that sank the Whydah. One year later, Williams retired from piracy, but returned to piracy for several more years. At 45, in 1723, he finally retired. He died of old age, something rarely afforded a pirate. After the sinking many tried to find where exactly the ship had went down and locals found artifacts and some coins on the beach washed from the wreck by the pounding surf. No one was able to find the wreck site until 267 years after it sank. It was Barry Clifford who had researched and dreamed of finding it for many years. It was the first recovery of a pirate ship wreck in U.S. waters. Thousands of artifacts have been recovered, including a crew member’s boot that belonged to the youngest of Bellamy’s crew. The first items found was the ship’s bell and anchor. Over fifty ship cannons, gold bars, nuggets and gold dust, and coins that took a long period of painstaking care to clean the encrustation off of many of the artifacts. The artifacts recovered reside in a museum in Provincetown, Massachusetts which Clifford dedicated to Black Sam. Black Sam Bellamy and the romance with the young woman from Massachusetts have been immortalized in a novel by Danelle Harmon entitled Pirate in My Arms. [I] The Republic of Pirates by Colin Woodward, NY, 2007, pp. 28-29. ISBN 978-0-15-603462-3. [II] Capt. Samuel Bellamy, Rogue Romeo; National Geographic. This entry was posted in Biography, History, Pirates.